Continuing with the last post that covered one of the enemies of the plants, in this post, I will be covering another enemy of the plants. 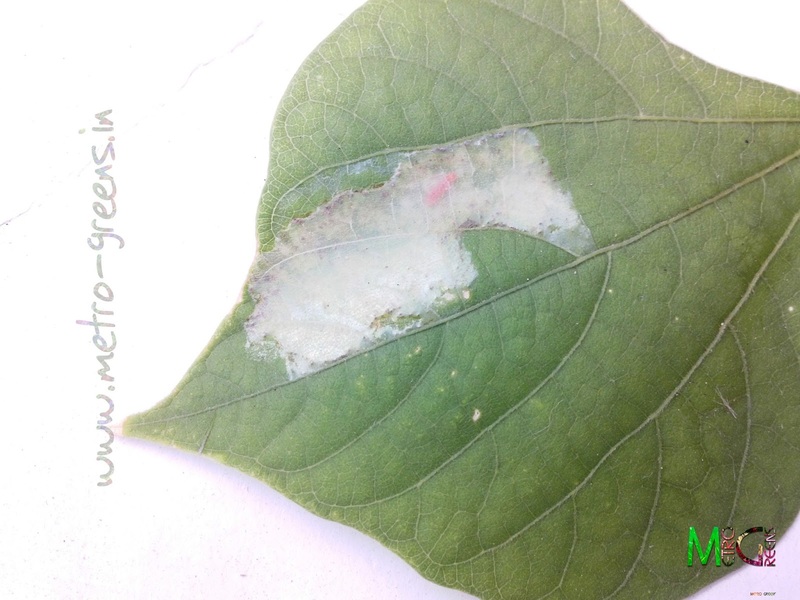 This time around, I am covering another leaf eating insect larva. Though, this time, I couldn't find which insect this larva belongs to, but, this one too definitely looks dangerous with the amount of damage it causes to the plant's leaves. I found this one on the leaves of my broad beans vine. While checking the leaves for the leaf miners, my eyes got stuck on the white patches on the leaves. When I inspected a few of the leaves, I found the larva inside too. This time around, I didn't delay removing the damaged and infected leaves from the plant and destroying the leaves. An infected leaf of a broad beans vine. Another infected leaf of a broad beans vine. And the third one. 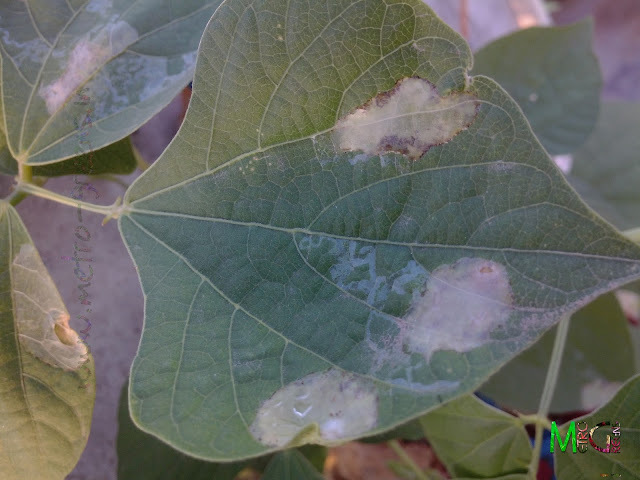 A number of other leaves were also infected. 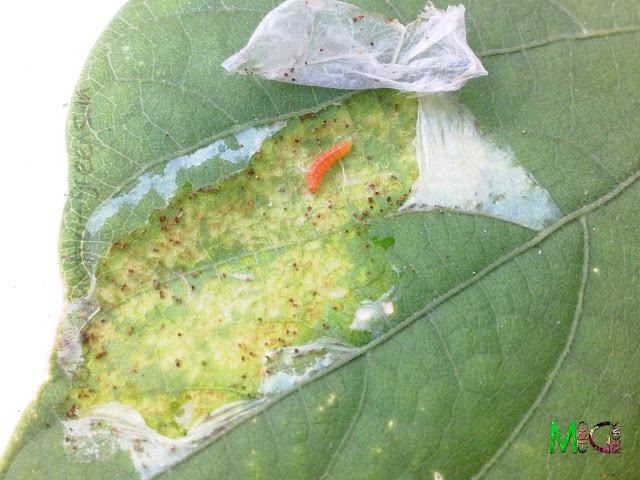 But, before destroying the leaves, I decided to check out what's in there, and I was in for a surprise, as there was one orange coloured small larva inside the white pockets of air that had build up within the upper membrane of the leaf. This time around too, like the last time, it seemed to be a member of the leaf miner family, just without those serpentine trails. This is because, the larva stayed inside the upper membrane of the leaf, roamed in the air pocket and fed upon the leaf’s tissues. 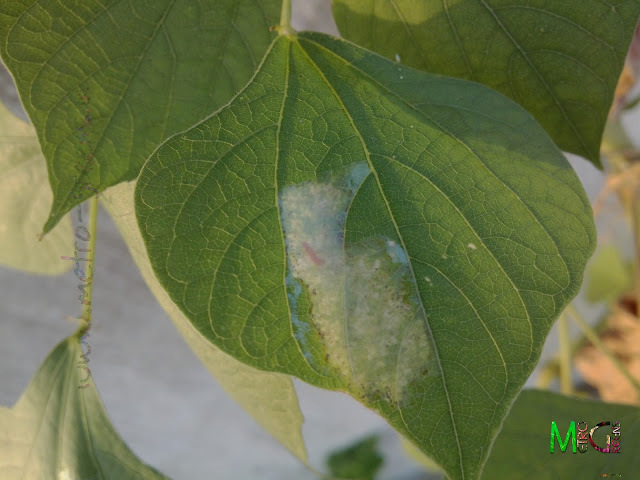 Staying inside the upper membrane of the leaf keeps these larvae away from the vagaries of nature or other predators, and also protect the larvae from the possible application of insecticides/pesticides against these. 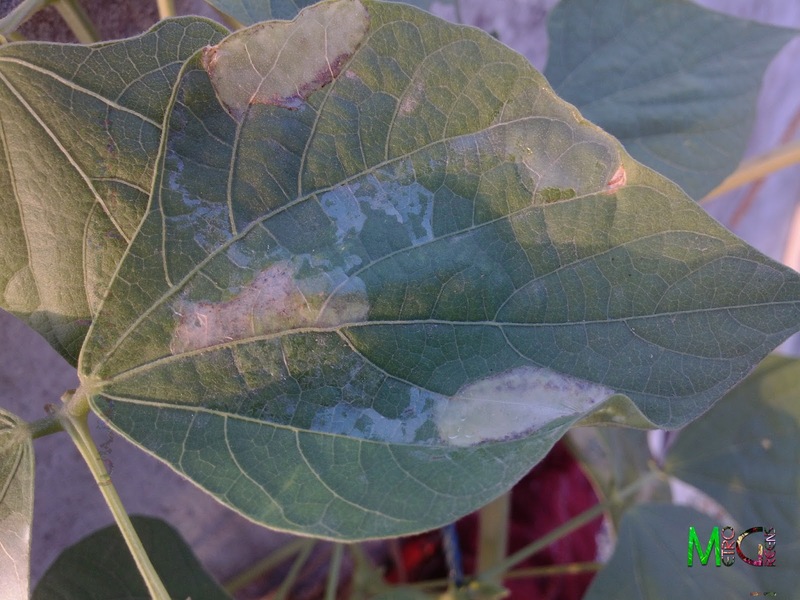 Another infected leaf. This one has a visible orange coloured larva inside the pocket. It's show time. The leaf was on my operating table. It was time to checkout the culprit. And here he is. The culprit behind the air pockets behind in these leaves. You can see an orange coloured larva along with some brownish matter, which, I believe is his excreta. Also you can see the green coloured leaf tissue has turned yellowish in the area of contact with this larva, which means this larva has a great potential to damage leaves. So, I removed all the visibly infected leaves from plant, and took one of the leaves for checking out what’s inside. Removing that air pocket revealed a small orange coloured larva which had eaten a lot of the leaf tissue beneath that air pocket and had pooped all around, and was living happily. So, I did what I’m good at with such things, squashed the leaves to floor of my roof, and this ended the tale of these larvae. My plants have been infested with some more varieties of insects, including one hornworm too, aphids are a regular feature, and the white mealybugs have now found a safe haven for themselves in container garden. As and when I come across and try dealing with them, I get success some times, and at some other times, I fail miserably, like in the case of the mealy bugs. 1. 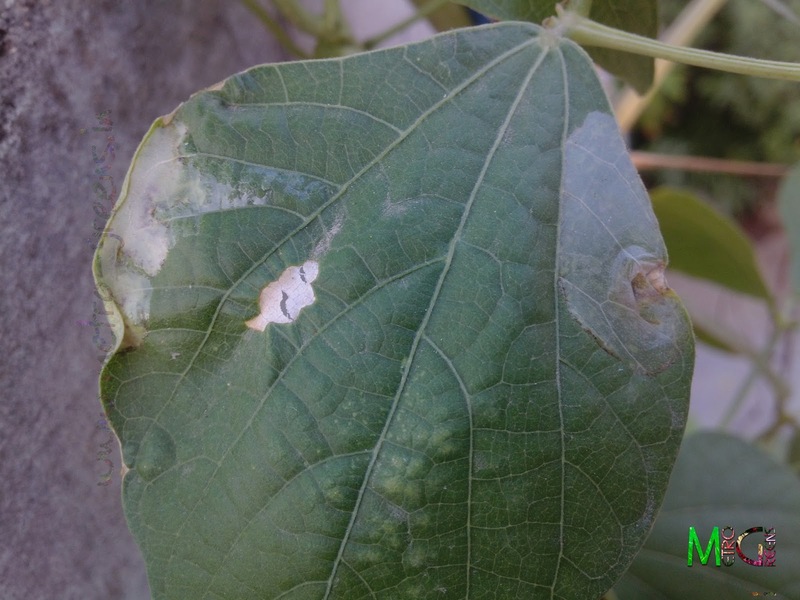 Whatever you do, when the larvae are inside, there is the least chance of killing one with application of an external insecticide or any other such method. 2. The best method I can see, for now is to remove the leaves altogether, else, you stand a chance to lose the whole plant. 3. Do make sure that you are destroying the infested leaf. You can do this by burning the leaf. You can use the ash of the burned leaves or other organic matter of your plants/kitchen as a fertilizer also. Throwing away the leaves might not serve the purpose, as the larva may survive and may come back in the form of an adult insect to prey upon your plants. I will be back with more tales of success and failures in my gardening adventures in the upcoming posts. Till then, keep visiting and HAPPY GARDENING!